Press Release – For Immediate Release. Perma Pools, a builder of custom in ground pools in Indianapolis, announced today that it was awarded the Indiana In ground Pool Dealer of the Year Award by Pacific Pools of Latham NY for the second straight year. Pacific Pools is a 50 year old brand and is a major national manufacturer of vinyl liner pool kits, both steel walled and polymer. 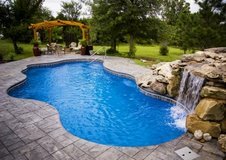 Perma Pools is their exclusive dealer in Central Indiana. Perma Pools started building in ground fiberglass pools in 1987 and started its vinyl liner in ground pool division in 2005. Since inception, Perma has built over 3,000 in ground pools in the Central Indiana region. In addition, Perma Pools runs a full pool service and renovation division.